America is strengthened by the rich cultural diversity of our people, and we are blessed to be a Nation that welcomes individuals of all races, religions, and cultural backgrounds. The values and traditions of the Asian/Pacific-American community -- love of family, entrepreneurship, excellence in education, and community service -- have strengthened us as a Nation. During Asian/Pacific American Heritage Month, we celebrate the contributions of these talented and hard-working citizens and recognize their rich legacy of ingenuity, perseverance, and achievement. Many Asian/Pacific immigrants came to America to discover the promise of our Nation and to realize their dreams. Their contributions were critical in establishing a robust economy. Asian/Pacific Americans also worked tirelessly to build our national railroad infrastructure, paving the way for our western expansion and growth as a world leader. Generations of Asian/Pacific Americans have proudly served our Nation with honor and courage in wars and conflicts, including most recently in Operation Iraqi Freedom and Operation Enduring Freedom. Today, as in the past, their dedication and service to advancing peace in a troubled world upholds the values that make our country strong. Asian/Pacific Americans are also helping to shape America's future. As entrepreneurs, artists, educators, public servants, scientists, and explorers, they challenge the minds of our next generation, expand commerce and innovation, probe the frontiers of space, and search for cures for the world's diseases. Our children are also inspired by the contributions and sacrifices of dedicated individuals such as inventor An Wang, experimental physicist Chien- Shiung Wu, Challenger astronaut Ellison Onizuka, Columbia astronaut Kalpana Chawla, and sculptor Isamu Noguchi. To read the rest of the proclamation, click here. Madame Chiang Kai-shek, the widow of China's leader during World War II and the era's last surviving global figure, died in New York. She was 106. Katherine Cheung, a Chinese immigrant who defied tradition in the 1930s to become the nation's first licensed female Asian American aviator, died Tuesday of natural causes at her home in Thousand Oaks. She was 98. 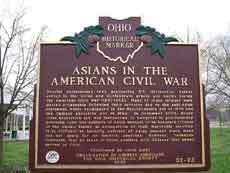 The Organization of Chinese Americans (OCA), a national Asian Pacific American (APA) civil rights advocacy and educational organization with over 80 chapters and affiliates nationwide, participated in the unveiling of the first historical marker in the United States dedicated to commemorating the American Civil War solders of Asian descent in Columbus, Ohio. The unveiling on April 26, 2003 took place in Franklin Park in Columbus. This event was in conjunction with OCA’s National Board meeting and was well attended by members of the board as well as government and community leaders of the state of Ohio. Congressman Mike Honda (D-CA) served as honorary guest at the banquet celebrating the unveiling of the historical marker. During the last Congress, Congressman Honda introduced a Joint Resolution posthumously proclaiming soldiers of Asian descent who fought in the Civil War to be honorary citizens of the United States (H. J. Res. 125). There were numerous soldiers of Asian descent that fought bravely in the Union and Confederate forces during the Civil War. Congressman Honda was appointed by DNC Chairman Terry McAuliffe to be the Deputy Chair of the Democratic National Committee. Noel Toy Young (who died in Antioch California on December 24, 2003 at the age of 84) was America’s first Chinese fan dancer. This sensual, outspoken and rebellious person was a true firecracker and a pioneer ahead of her time who help pave the way for Asian American performers throughout the country during a time where the were expected to be the prim, reticent and submissive Asian female stereotype. Tribute and Remembrance: Asian Americans After 9/11, commissioned by the Asian American Federation of New York, produced by Renata Huang, and narrated by David Henry Hwang, is a 69- minute documentary that examines the multitude of ways the September 11th tragedy impacted the Asian American community. In 2003, California Governor Arnold Schwarzenegger appointed as his agriculture secretary A.G. Kawamura. Kawamura, born in Orange County in 1955, is a third-generation farmer who, with his brother Matt, tends 600 acres of small rented farm plots scattered across heavily Republican Orange County. Kawamura is the grandson of Japanese immigrants who worked in thefields before starting a feed and supply business. During World War II, they were sent to a detention camp in Gila, Ariz.; they stayed there until the mid-1950s. After college (a comparative literature graduate from the University of California, Berkeley), he harvested grapes near Bakersfield before joining the family business, now called Orange County Produce. Hong Kong heartthrob singer and actress Anita Mui (born on October 10, 1963 as Mui Yim Fong) died of lung failure that was caused by cervical cancer in a Hong Kong Sanitorium Hospital at 2: 50 a.m. on Tuesday: December 30, 2003 surrounded by friends such as Jackie Chan, Willie Chan, Alan Tam, Andy Lau, John Shum, Eddie Lau and Eric Tsang. (Her other friends include Zhao Wenzhuo and Nicholas Tse) She was 40 years old. Douglas Fang, chief operating officer of the San Francisco Examiner and other Fang family Bay Area publications, has died. A graduate of Lowell High School in San Francisco, Douglas Fang earned his bachelor's degree at UC Berkeley. Master's and doctorate degrees in computer science followed at USC, where he served briefly on the faculty. After graduating, a href="http://groups.yahoo.com/group/asianamericanartistry/message/2668" target="_blank">Fang helped start, develop and operate several high-tech companies, including Bridgespan, where he served as a senior vice president.